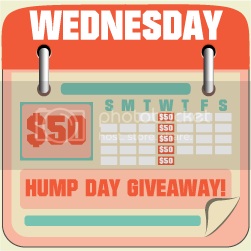 Thanks to the 27 wonderful bloggers listed below, it's time for Hump Day $50 Giveaway once again. This week's task is for Facebook Page likes which is super easy to do. Feel free to visit all the wonderful blogs below once you're done entering the giveaway. You can log on to Rafflecopter via your Facebook account, or your name and email (just make sure you're Facebook is opened so you can easily like the pages). Once you've liked the page (Like button turns gray), leave your Facebook Profile Name (not a Business/Blog Page) on the space provided for Extra Info after doing the task so we can verify your entry. It would be best if you enable us to see the pages that you liked in your info tab so we can announce the winner ASAP. On the first mandatory entry, please write Drama Queen referred you. You must complete the first 2 tasks before the others are enabled. For a chance to win an additional $50, head on over to My Bric-a-brac and write My Bric-a-brac in entry #1. Good luck! Thank you for the giveaway would be wonderful! Also Earth Friendly and Health is Wealth I get a 'Could not retrieve ID' error. thanks for joining! keep it coming!